Ivana Kadija is Chair of the City School Board's School Health Advisory Board -- and has been an active member of the Clark Elementary School PTO since 2008. As a health advocate, Kadija collected (to date) over 1,000 signatures  from local residents demanding that city schools limit the amount of sugar given to students. Signatories include Mayor David Norris, City Councilors Satyendra Huja and Kristin Szakos, Dr. Gregory Gelburd, Dr. Zachary Bush, Dr. Martin Albert, Dr. David Aller, Dr. Dean Kedes, Dr. Paul Wisman, Dr. Paul Lyons and Wayne Berry, a psychologist with the Virginia Dept of Education. Ivana Kadija is a nutrition and wellness counselor certified by the Institute of Integrative Nutrition. She is also the founder and CEO of Yourishment.com, an online food and lifestyle network. Kadija also has a BA from Columbia University. 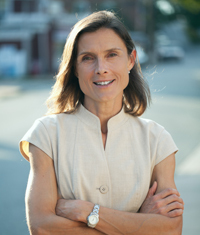 Kadija was a candidate for the Charlottesville City School Board in the 2011 election., coming in sixth of the seven candidates for four seats. ↑ Web. Sugared down: Advisory board calls for healthier school food, Courteney Stuart, The Hook, Better Publications LLC, 25 May 2011, retrieved 26 May 2011. ↑ Web. Un-super Size Me: Can City Schools Stem the Obesity Epidemic?, Courteney Stuart, The Hook, Better Publications LLC, August 23, 2011, retrieved September 4, 2011. ↑ Web. Health activist running for city School Board, Graham Moomaw, Daily Progress, World Media Enterprises, 28 July 2011, retrieved 5 August 2011. This page was last edited on 20 April 2012, at 09:30.